The history of carmaking in The Netherlands is can pretty much be summed up by one acronym: DAF. They built some interesting cars before that division of the company was bought by Volvo. But that DAF plant in Born has turned out an odd string of vehicles for almost 50 years. 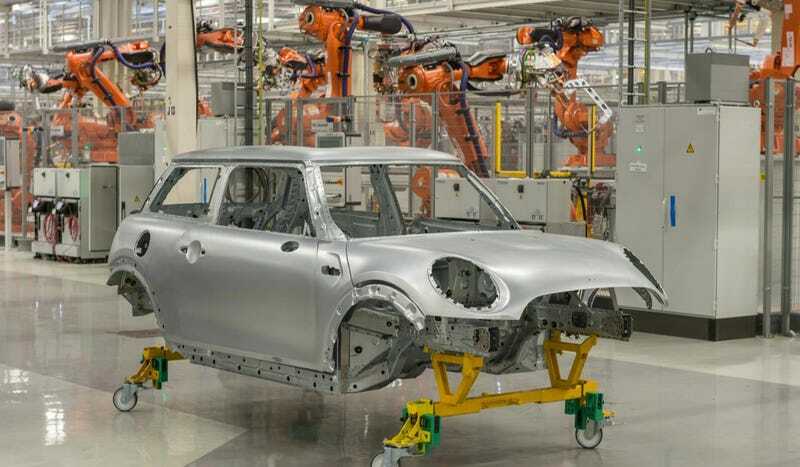 BMW announced Monday the 2014 Mini would begin production in the Netherlands beginning this summer, in addition to its UK home. The plant now known as VDL NedCar is now a plant for contract manufacturing, like Valmet in Finland and Magna Steyr in Austria. But before, it was run by Volvo and Mitsubishi, turning out an extremely diverse range of cars – some of which were sold in the U.S.
With some photos, let's take a look at some of the cars that were born in the Born plant. They range from weird, to normal, to Mitsubishis and then to quirky. It's a strange photo tour. Ooh, here it is in a crazy ad. DAF opened the plant in Born, later to be called NedCar, in 1967 to start building the 33 and 44 models. Later, it started with the 55 and 66 models. They were mostly known for the Variomatic transmission, a belt-driven continuously variable transmission. So, direct your CVT hate towards these little Dutch cars if you must. What The Hell Are These Women Doing With All These Hats? The DAF 55 Coupe is very pretty, however. The Volvo 66 was really a DAF 66 with some Volvo headrests. Produced from 1975 to 1980, it represented Volvo's takeover of DAF's automobile business and the start of the Volvo era in The Netherlands. The 340 was really a DAF that had some Volvo input. It still featured the CVT, as well as rear wheel drive and a DeDion rear axle. Something tells me this might've done OK in the U.S., especially when it started production in 1975. Apparently Jeremy Clarkson hated the 340/360, which makes it suddenly very interesting to me. The 440 was the first front-wheel drive Volvo, but since we never got it most Americans associate the 850 with a turning point for the Swedes. It's a tad boring, but a weird spoiler on the back helps. The 480, despite being based on the 440, was a truly interesting car. For the first time since the 1800ES, Volvo thought a big glass door on the back was a good idea. It wasn't a shooting brake, though, it was definitely a hatch. Still, for 1986 it looked really good. We were supposed to get it in the U.S. for $11,000 in the fall of '87, according to Popular Mechanics! That clearly didn't happen. We had to wait 20 years for the C30. There was even a convertible, complete with basket handle, planned. It looks vaguely like a Geo Metro Convertible, also of the same era, so it's probably best it didn't enter full production. Yeah, not sure what happened here. These are, um, some cars. And please, make jokes about its un-charismatic looks. The 40-series Volvos were actually sold in the U.S. starting in 1999. They weren't exactly popular or memorable until Volvo based them on a Ford Focus platform and sourcing them from their Belgium factory. Then they became a little more popular and memorable. It's a car... that was made from 1998 to 2005. In the bizarre era of the early 2000s, the DaimlerChrysler-Mitsubishi tie-up yielded a four-door, four-seat, Dutch-built Smart based on a Mitsubishi. When Volvo pulled out of NedCar, Mitsubishi needed to fill the space left by the S/V40 with something. So they canceled the Carisma and brought in the Fiesta-sized Colt, as well as the Smart ForFour. The 2004 Colt actually looks pretty good. The Smart was cut short after being produced for little more than two years as DCX ran around trying to stem losses everywhere it could. Now Smart is coming back with a new ForFour twinned with a Renault Twingo. Mitsubishi? Well, they killed the Colt in 2012, pulled out of NedCar and globalized the Mirage. While we only got the Outlander in the States, Europe was given Citroen and Peugeot variants. The Citroen C-Crosser, despite its absurd name, actually looked very classy. Unfortunately it wasn't redone when Mitsubishi made a new Japanese-built Outlander. The Peugeot, on the other hand, was borrowing from the Mazda charm school with that crazy grin. I'm sure it looked ridiculous in person, but the photos make it look interesting and hide the fact it's so obviously a Mitsubishi. Apart from the Smart, the Mini might be the funkiest real car to come out of The Netherlands since the DAFs. It does have a turbocharged three-cylinder, and it still looks interesting. But wouldn't it be great to see what some Dutch engineers would do to it? Wonder what Spyker's people are doing.